I was recently contacted by a young lady by the name of Lisa Barrett. She said that she was a descendent of Maria Rosa Villalpando. Apparently three-fourths of New Mexico is related to our clan. She had also said that she had spoken to Tom Martinez (Tommy) and that she would like to talk. I was excited. Of course, with my schedule (and I’m sure her schedule is just as busy) a few days had passed. But I kept thinking about her. So, as soon as I could, I went back to the blog to send her a note asking her to contact me by email. On the blog, I had a message from her asking me to contact her. I laughed and thought we were on the same wavelength. I had a quick email conversation with her and then she asked me if we could have a phone conversation. We set a time for the following Sunday. I was sitting at a baseball game, naturally, and pulled out my phone thinking I would write to her and find out a good time and she had already written to me. We really were moving in harmony. She said her ancestor was Ramon Jaquez. Now that name meant something to me. I knew Ramon Jaquez was a full brother to Juan N. Jaquez. 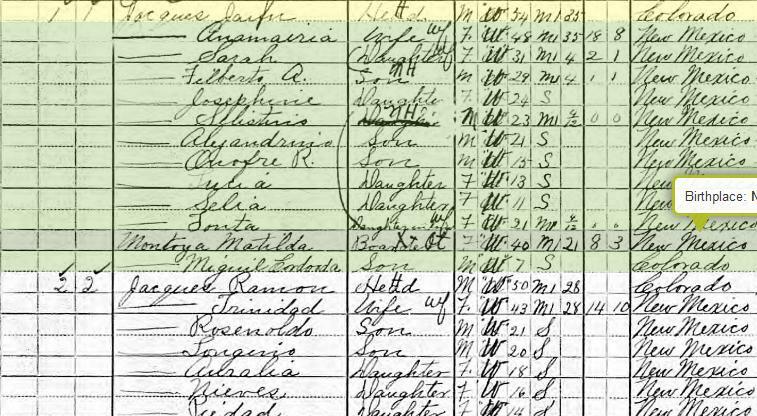 Here we find Juan N. on the 1910 census, living next door to Ramon Jaquez and his family. As you can see, Jose Eusequio is listed as age 31, wife Francisca Vigil is age 28 and their children are Victoria, age 5, Juan N. age 3, and Josefa, age 9 months old. I would suspect Francisca is pregnant with Jose Ramon since he was born in November of this same year. 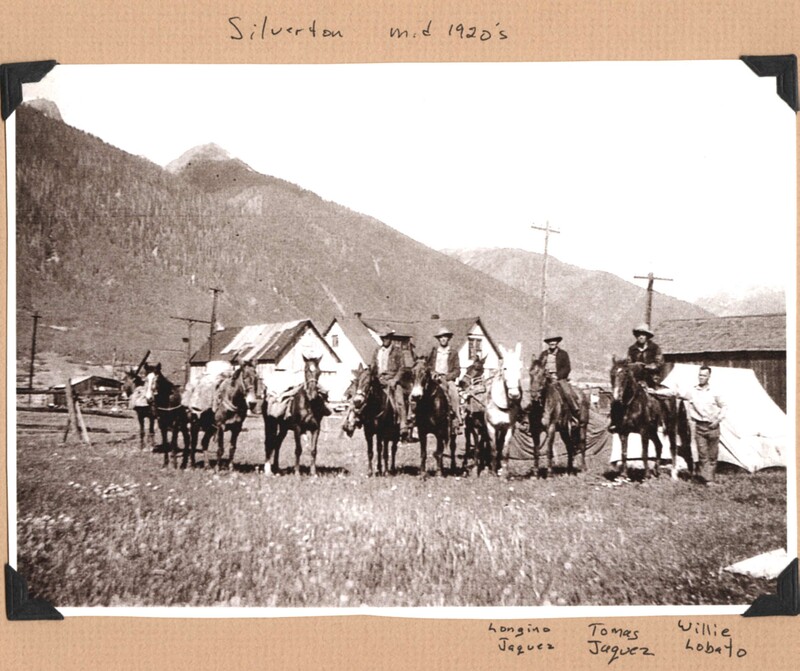 This census was taken in the Taos Valley, NM. This is from the 1870 census and now we see Juan N. age 14 and brother Jose Ramon age 10 living together. 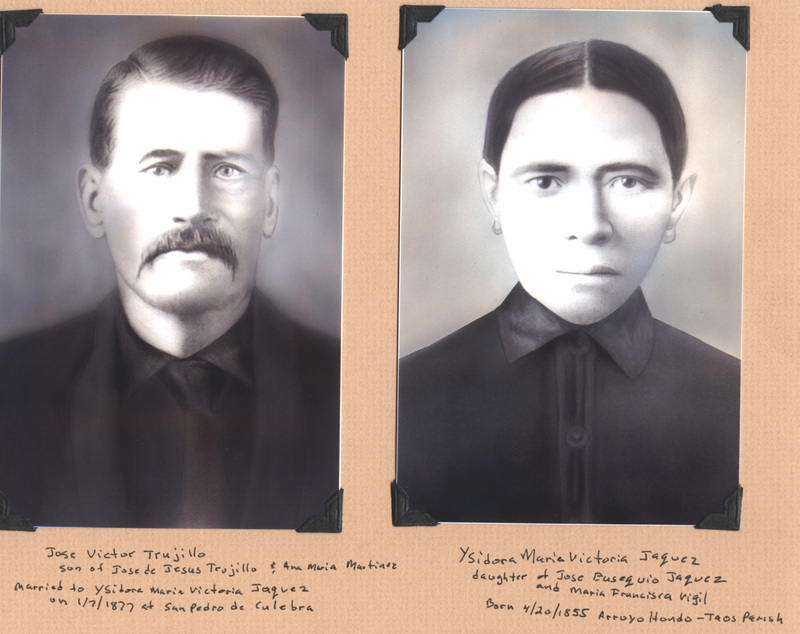 To continue, Jose Ramon Jaquez marries Trinidad Maria Munoz on October 18, 1882 in El Rito, Rio Arriba, NM. The census shows they had 15 children. That is a big number in my book. It makes Celestino Jacques and T.S. Archuleta’s families of 12 children look paltry. I am going to concentrate on their son Longino Jacques, but before we get to him, let’s look at something else. 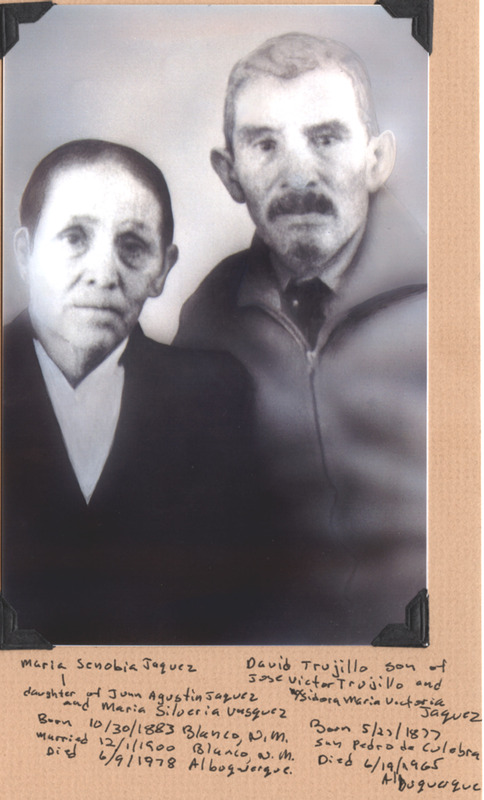 On the left side of this photograph is Ramon and Trinidad Jaquez. 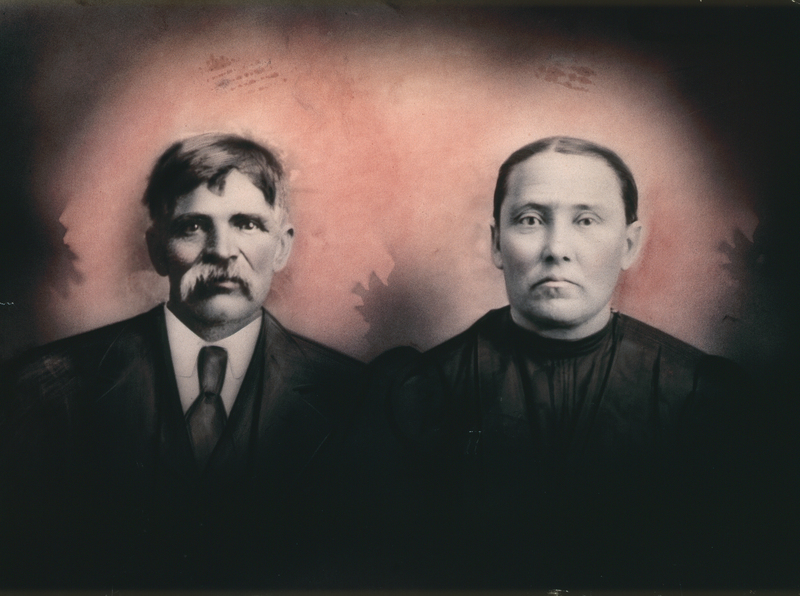 The couple in the middle is Tobias and Luisa Jaquez. Tobias is the son of Ramon and Trinidad, a brother to Longino. 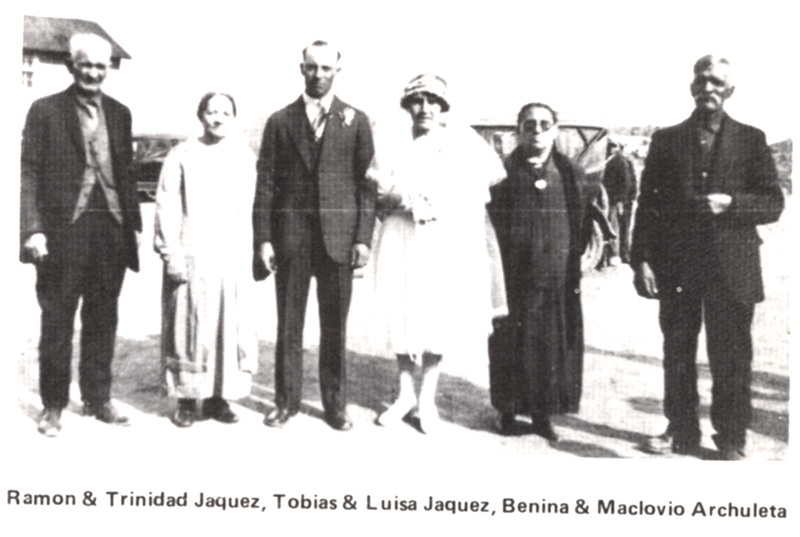 The couple on the right, they are Benina and Maclovio Archuleta. Of course, we’ve already met Maclovio and Benina Archuleta in my blog post entitled “Ricardo de Jesus Archuleta” as Maclovio is the brother of Ricardo Archuleta. Round and round we go, Jaquez to Archuleta and Jaquez again. Tough to follow, I know, and a little dizzying. Anyway, I thought it was a great picture and a fun sidetrack but now back to Jose Longino Jacques. 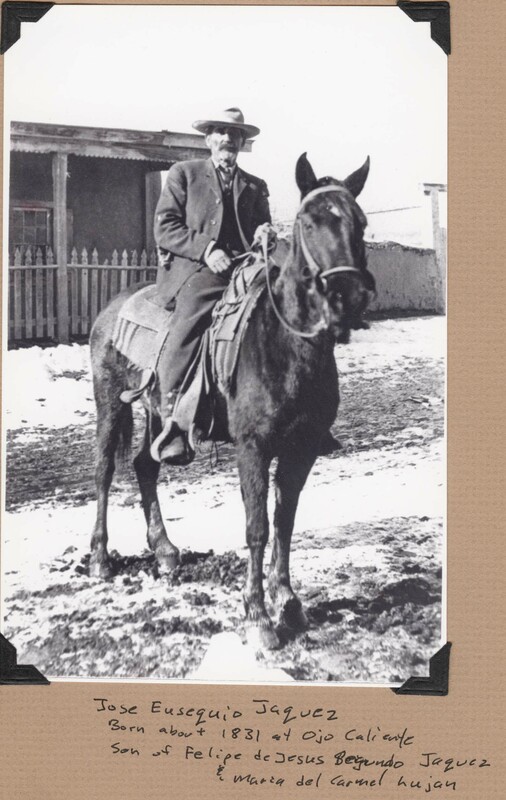 Jose Longino was born on May 15, 1891 in Blanco, NM. 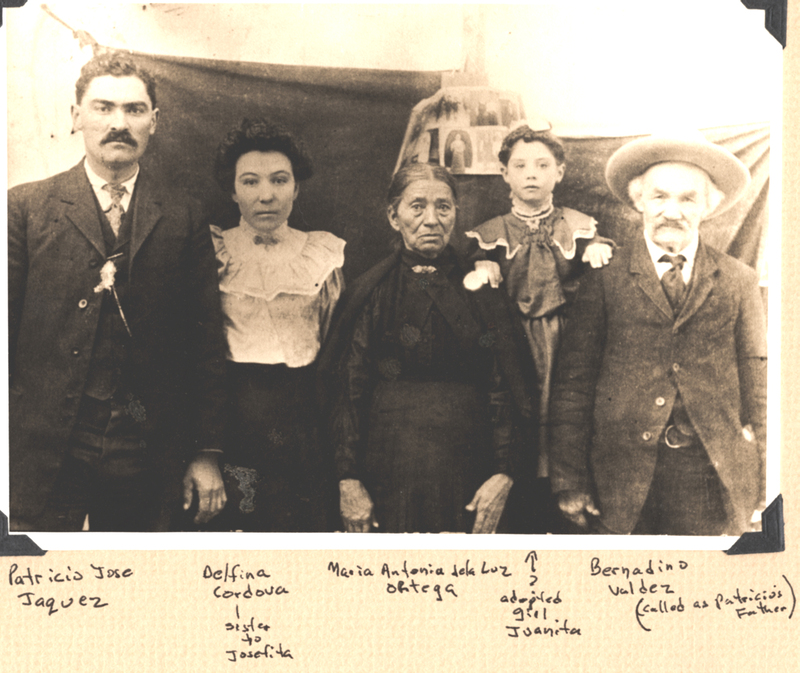 He married Francesca Jaquez on September 2, 1914 in El Rito, NM. 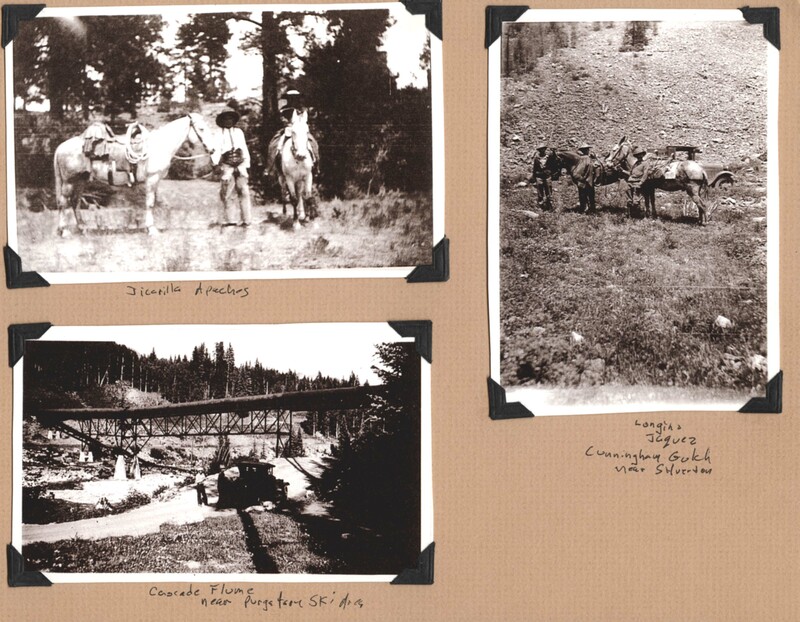 This picture shows it was taken in the 1920’s and it is Longino along with his brother Tomas Jaquez. John Glen Eldon, Ramon Arturo, Longino, Ramon, Triny, Eugenio Matthew, Severino, Ernesto and Nieves Jaquez. A second picture of Longino Jaquez. So looking at the list, Eugenio Matthew Jacques is Lisa Barrett’s grandfather. I switched the spelling of his name as Lisa sent me a copy of a list she had made of her aunts, uncles, mother and her own children. That is how she spells her grandfather’s name. Funny, my own birth certificate is spelled Jacquez and my parents changed the spelling when I was in elementary school to Jacques. That is how I spelled my son’s name. So Eugenio Jacques was born on February 15, 1918. He married Eginia Valdez and their daughter is Mary Louise Jacques. If you look at my Facebook friend list, Mary is listed as Mary Hill Schimmels and she is my (or if you are in my generation…lol) 3rd cousin, in case you want to say hi to her. So, back to my conversation with Lisa Barrett. She lives in Elko, NV and is my 3rd cousin, 1x removed. She is very interested in ancestry and was researching Maria Rosa Villalpando and our collective history. Her family had a small party and she had Tom Martinez speak to her relatives about research. She said they had a lot of questions. We all do. I think you get the most benefit from doing the research yourself. When you find a document that pertains to your ancestor, pull it out and really read the entire document. Write down all of the pertinent information and contemplate what it means to you. The help of other researchers such as Tommy Martinez are invaluable. You may have questions about where researchers get their information. Ask questions. Question everything. Look for the proof. There will be always be debate about proof, even if you believe information that others have found. Happens to me all the time . Lisa Barrett would like to meet up at one of the Jaquez family reunions. Since our phone conversation lasted for an hour and a half, I think we would have a very good time together. I see New Mexico in our future.